When former hobby kingpin Bill Mastro appeared in a Chicago Federal courthouse last October and plead guilty to one count of mail fraud, his plea agreement included details of the auction house improprieties which contributed to his possible five-year sentence in a Federal prison. Mastro was scheduled to be sentenced last December, but papers filed in court postponed the sentencing until June when it was again pushed off until October. Mastro’s co-defendant, Mark Theotikos, was also scheduled to change his plea to guilty in June but on Wednesday his hearing was again postponed from July 28th to August 6th when he is expected to enter a guilty plea. Mastro’s other co-defendant, Doug Allen, is scheduled for trial in September. 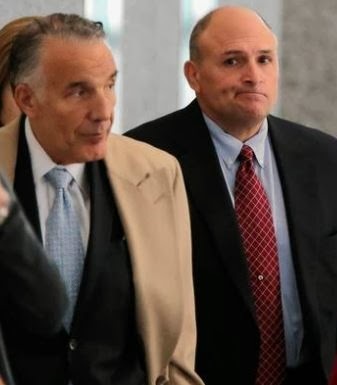 Mastro’s plea agreement stipulates that he must cooperate with the Government in its case against his co-defendants but it also details the elaborate shill-bidding scheme that prosecutors allege Mastro and his employees engaged in from 2002 to 2009 at Mastro Auctions. Mastro’s plea agreement describes an episode that transpired in 2002 when Mastro “placed shill bids to drive up prices” on items bid on by Tom Noe, a coin dealer and Republican fundraiser from northwest Ohio. Back in 2006, Michael O’Keeffe of the New York Daily News reported that Ohio investigators suspected Noe had made purchases at Mastro Auctions with state money and that in the course of a probe called “Coin-Gate” discovered that Mastro Auctions “may have engaged in shill bidding and other questionable practices that resulted in inflated prices and auction house commissions.” Ohio State Auditor Betty Montgomery estimated at the time that Mastro had sold Noe “at least $1.3 million worth of memorabilia” and in 2012 Noe was sentenced to 18 years in state prison for theft, money laundering and other charges. In one specific instance noted in Mastro’s plea agreement, the government details Mastro’s shill bidding in his 2002 Spring Americana auction against Noe who had contacted Mastro “directly in order to place ceiling bids in the auctions.” In 2006, an anonymous source told the New York Daily News that “Noe had a secret account with Mastro Auctions, and the only person at Mastro Auctions allowed to conduct transactions with Noe was CEO Bill Mastro.” The Mastro plea agreement states that Noe placed “up to 100 ceiling bids through defendant depending on the auction.” Mastro then utilized “a shill account belonging to a friend of an auction house employee to drive up Individual T. N.’s ceiling bids.” Mastro’s shill bidding ultimately inflated the prices of several items Noe won including “a 1924 John W. Davis Jumbo Campaign Display Badge for $2,338″ and a “set of 1960 John F. Kennedy and Richard Nixon Campaign Posters for $2,205.” The government states that the bidder would have won those auction lots for for a lesser price had Mastro not shilled him. Mastro also sent invoices and the auction lots to an associate of Noe thus creating the basis for his plea of guilty to one count of mail fraud. Bill Mastro (inset left) plead guilty to shill bidding former Ohio Republican fundraiser and convicted felon Tom Noe (center). 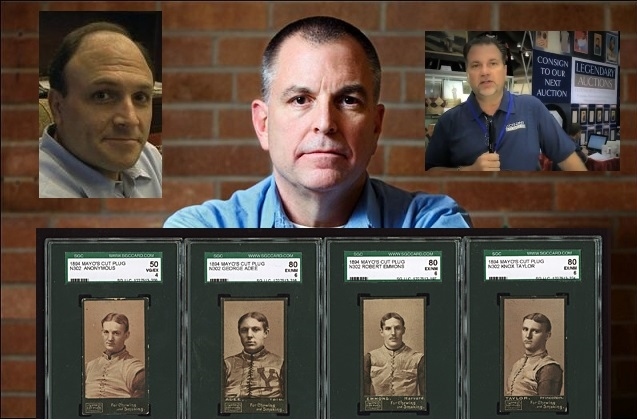 The plea agreement also alleges Mastro and partner Doug Allen (inset right) shill bid a customer on a rare set of Mayo football cards from the 1890s. (bottom). The government documents show how Mastro “repeatedly shill bid” customers like Noe and also “had access to ceiling bids because of his position” and also detailed how sometimes bidders placed those ceiling bids directly with Mastro and his partner Doug Allen and how Mastro says both men would ”drive up the bids of certain bidders, by placing shill bids below the bidders’ ceiling bids.” In another specific instance the court papers state that Allen knew a certain bidder had “placed a ceiling bid of $80,000 on a Mayo football card set” and that Mastro “observed as Allen, using a paddle belonging to Owner A, placed shill bids on the Mayo Football card set knowing that his bids would not win and would trigger Individual C. L.’s ceiling bid.” The set sold in the 2006 auction for $91,535 including Mastro’s buyers premium. Bill Mastro sits at the phone banks of his "Best of Yesterday" phone auction in 1996, years before computer and online bidding became the norm in the industry. Additionally, Mastro also violated a 2007 “Code of Conduct” established by the auction house whereby he “failed to disclose items that were owned by the auction house” and another company “Historical Collectibles” which was owned by the auction house and had its “merchandise, records and other assets” stored at the Mastro auction house. The agreement reveals that between 2008 and 2009 “Mastro knew that the auction house failed to disclose ownership of over 1,000 items owned by Historical Collectibles” and also engaged in placing “ceiling bids on several hundred items owned by Historical Collectibles that Mastro had previously owned. Contrary to Luckey’s claims that he did not engage in this bidding practice, several sources allege that Luckey was a prime example of this activity and was included in the circle of friends both Mastro and Allen knew engaged in such bidding agreements with other friends and associates. Sources also indicate that since Mastro allegedly destroyed bidding records from the pre-2007 auctions, Luckey felt confident his bidding would not be recognized in the FBI investigation into Mastro. Between 2007 and 2009 Luckey vehemently defended Mastro and Allen and attacked other forum members who criticized and leveled accusations against the auction house and its principals. Luckey claimed New York Daily News reporter Michael O’Keeffe had “a vendetta” against Mastro and banned a forum member named Aaron Michiel for calling him “Mastro Monkey” in his online posts. Net54 moderator Leon Luckey (left) banned a member who called him "Mastro's Monkey" for his support of Bill Mastro and Doug Allen. 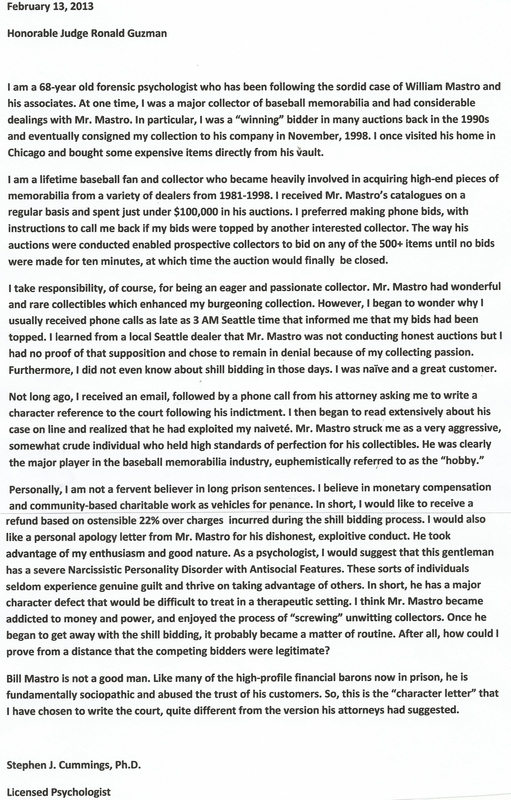 The collector "Aaron M." posted his reaction to Mastro's guilty plea on another forum (right). 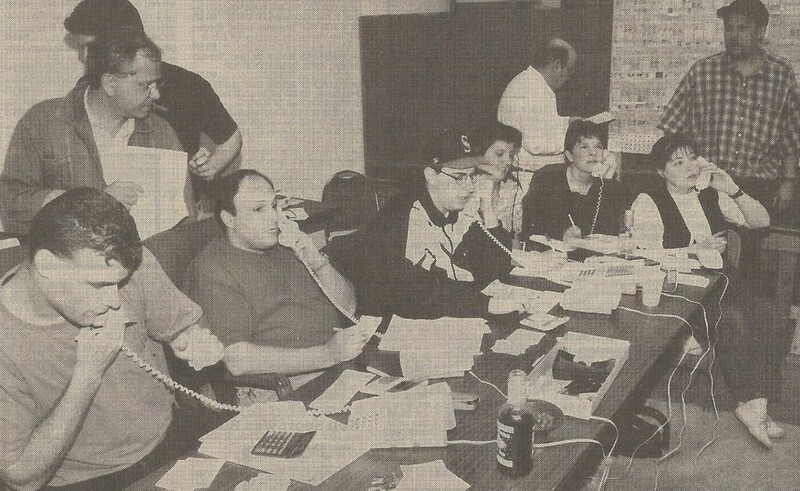 After Mastro’s guilty plea Aaron Michiel took to the Vintage Non Sports Cards chat board after Mastro’s guilty plea stating that back in 2007 he “grasped the scope of (Mastro Auctions’) criminal activity” and reiterated how Luckey was “completely in Bill (Mastro) and Doug’s (Allen) back pocket and defended them at any chance.” Feeling vindicated even more Michiel referred to Luckey in another post last week writing, “The Mastro Monkey finally turned on his master.” Aaron then posted Luckey’s recent comments about Mastro’s posting on Paul Lesko’s CardBoard Connection article in which the disgraced auctioneer showed little remorse for his misdeeds. Luckey responded to that post saying he found Mastro’s statement “disgusting” and promised that he would be writing a letter to Mastro’s judge to voice his displeasure. One thing that Leon Luckey and Aaron Michiel have in common is that both say they believe they are victims of Mastro’s shill-bidding scheme. There are scores of Mastro customers and collectors who believe they were shilled as well as others who suspect they were but just don’t know for sure. The one’s who know for sure were contacted by FBI agents in the course of the Mastro investigation and were told the details of the shill-bidding process. Last year, Paul Lesko published two of the letters written by Mastro’s victims that were sent to Judge Ronald Guzman, but sources indicate that many other letters were sent by victims chronicling their personal stories and thoughts on the ex-hobby kingpin. Last year Hauls of Shame secured another letter written by Mastro shill-bidding victim Stephen Cummings, a forensic psychologist from Seattle, Washington. Cummings was contacted by one of Mastro’s attorneys to write a character reference letter to the Judge in support of Mastro but instead decided to write a letter he describes is “quite different from the version his attorneys had suggested.” In the letter, which was made public by the court on Wednesday, Cummings offers his personal analysis of how Mastro was “sociopathic and abused the trust of his customers.” Cummings also suggests to the Judge that Mastro “has a severe Narcissistic Personality Disorder with Antisocial Features” and that he became “addicted to money and power, and enjoyed the process of ’screwing’ unwitting customers.” Cummings also requested a refund for “22% over charges incurred during the shill bidding process.” Cummings’ letter appears in its entirety (below). Shill-bidding victim Stephen Cummings sent this "character reference" letter to the Judge in the Mastro case. Well I sent in a letter stating I had nothing but good dealings with Bill over the years. Was I ever shilled in 1 of his auctions? Maybe, do I still get shilled to this day in other auctions? Maybe, but there is no way to tell and I just try to bid what I am comfortable paying and not think about it. And…. NEVER leave ceiling bids with certain auction houses! That is free money sitting in front of them on the table, what do you expect them to do? I know… Be Honest. good for Stephen Cummings for his letter. I just hope the legal team doesn’t use this letter as a cause for mental insanity in regard to this case. He went dangerously to close in detail description of his character. I guess this is what psycologists do but don’t give the defense something to sink their teeth in! I don’t wish bad things on anyone but this man has a bed right next to Bernie Madoff I hope. In closing Don Steinbach is probably better off that he passed early. Maybe it was God’s calling to save him from his partner’s nightmare greed tendencies. I wonder how Don Steinbach would have handled this or would Mastro have stayed honest if Steinbach lived? Glad to see the courts are and will act on these cases of fraud to John Q. Now the others who think they are scott free,had better keep a eye out over their shoulder,cause they could be next, to bite the bullet. You were defrauded by Mastro. Prices on items were falsely inflated due to Mastro and Allen’s fraud — you overpaid because of it. Not leaving a ceiling bid made no difference with these guys — they were running people up, one bid at a time, giving a false sense to bidders that that they were bidding against a legit other bidder. Just paying what you thought you were ‘comfortable with’ makes no difference; perhaps their shill bidding still made you pay too much? Bill and Doug were the biggest fraudsters in the history of our hobby and they deserve severe prison sentences. Bill’s pitiful claim of finding God is as much of a load of crap as everything else about him. The judge will learn the truth as he sees an avalanche of bad character letters, something that rarely happens at criminal sentencings. Not Mastros Monkey…If you think Mastro and Co are the only auction crooks you are sadly mistaken. The current auction heads are cut from the same cloth and just havnt gotten caught yet. Dan McKee gives the best advice about never leaving a ceiling bid but that doesn’t cover all the fakes and altered material tbey sell at will.